I have been warning US treasury bears for quite some time, but I now wonder if we have seen a bit of short-term capitulation. Before discussing further, let's first look at a Mish Mailbag. I was thinking that margin calls would be made after today and could pull the market down further by Friday. Do you think margin calls would be made to any degree yet? Also your article Stock Buybacks Peaked With Stock Market in 2007: History About to Repeat? would be a great post on Business Insider. Generally I stay away from short-term prognosis. As for equities, all I can offer is general advice: Huge plunges do not happen in overbought conditions, but rather oversold conditions. Even so, the tendency is to bounce not plunge. Are equity dip buyers about to give up? I don't know, but nor does anyone else (but when it happens the plunge is likely to be spectacular). 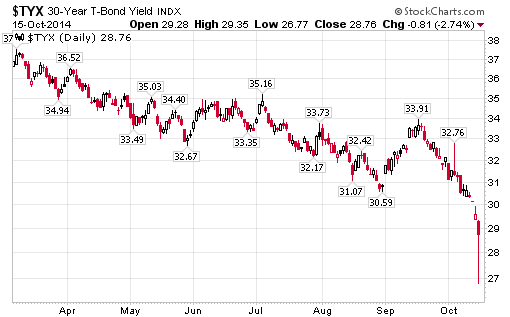 To me the bond market is far more interesting. I am on record as a treasury bull in belief the US economy is far weaker than most think. My position changes from time to time, and perhaps yields are at a short-term bottom. A few charts may help explain. 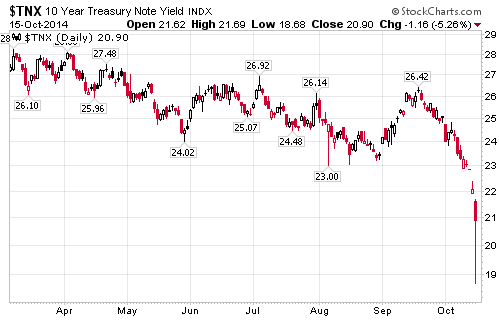 From top to bottom yield on the 30-year treasury went from 2.935% to 2.677%, a swing of 25.8 basis points. That's an enormous move. From top to bottom yield on the 10-year treasury went from 2.169% to 1.868%, a swing of 30.1 basis points. That's an even bigger move. In both cases, yields traded well off the lows. 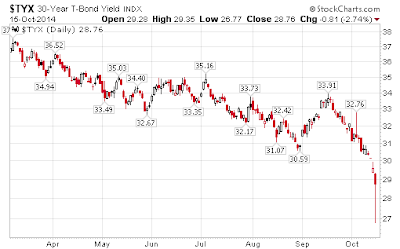 While the same can be said in equities, I have a lot more faith in the bond market (despite Fed manipulations). Simply put, the bond market does not believe the recovery story and neither do I.
Bloomberg reports Biggest Pain Trade Gives 37% Loss to Bond Bears Getting It Wrong. What a dismal time for bond traders who were optimistic about growth. Investors who poured more than $1 billion this year into a $3.8 billion leveraged exchange-traded fund that bets against long-dated U.S. Treasuries are suffering a 10.7 percent loss this month alone, Bloomberg data show. The fund is down 36.5 percent this year, a small window into the magnitude of pain in a market where many traders have been wagering debt prices would fall. Treasuries have defied predictions across Wall Street for higher yields all year, and yesterday’s move is sending bond bears into a tailspin. Yields on 10-year Treasuries fell the most since March 2009, trading below 2 percent for the first time since June 2013 as a decline in retail sales prompted traders to reduce wagers the Federal Reserve will start raising interest rates next year. The move is in part driven by traders covering their short bets, according to Jack Flaherty, an investment manager at GAM USA Inc. in New York. Primary dealers had the biggest short position on benchmark government notes at the beginning of the month since June 2013. They had a net $20.7 billion wager against notes maturing in the seven-to-eleven year range in the week ended Oct. 1, Fed data show. Bloomberg has the story right: There's a lot of hidden skeletons. Where to from here? I found treasuries attractive at the beginning of the year, and I also mentioned them at a Casey Conference presentation I made in September. Long-term treasuries are no longer the value they were then, but that does not make them a short. Convince me a recovery is coming and the Fed will hike and I will change my tune.